Falmouth Railroad Station was placed in service when the Old Colony Railroad inaugurated service on the Woods Hole Branch. The original Falmouth Railroad Station was sold to the Swift family, who moved the wood depot across the tracks. In its place, the New Haven Railroad built a replacement brick depot which stands to this day. Rail service ended and the former Falmouth Railroad Station was renamed as the Falmouth Station. Since then, it has been used as a bus depot by the Cape Cod Regional Transit Authority and Peter Pan Bus Lines. A 7.4-mile section of the rail line that once carried trains to the station was converted to a bike path, extending the Shining Sea Bikeway from Woods Hole to North Falmouth for a total of 10.7 miles. The Falmouth Station is located next to the bikeway near the 3.5 mile marker. 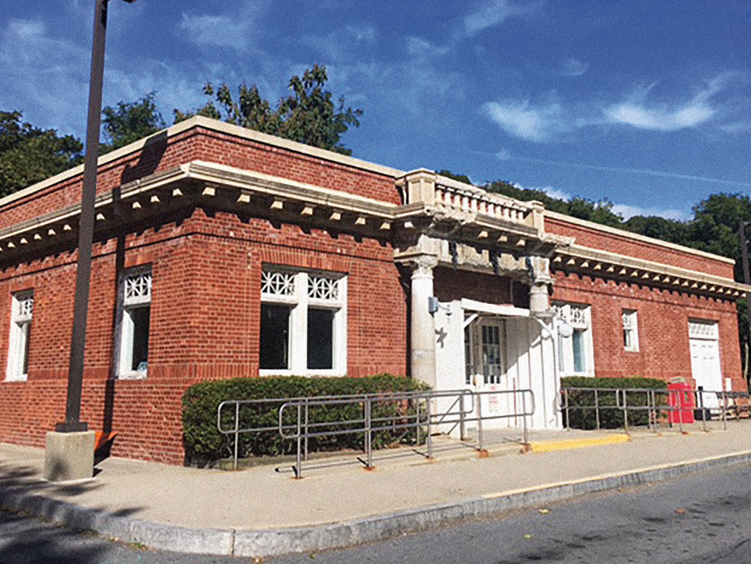 Falmouth EDIC acquired a 99-year lease from Massachusetts Department of Transportation in conjunction with a grant to renovate the Station. Falmouth EDIC enabled the restoration of the appearance of the 1912 building and repurposed it as the Town’s Transit Center. Future improvements will include a café and historic rail cars. General Contractor: A.P. Whitaker & Sons, Inc. Clerk of the Works: The Vertex Companies, Inc.
Site/Civil Engineer: Holmes & McGrath, Inc.
For more information about the Falmouth Station/Bikeway Connection project, please contact Christopher Simmler. For information about property management at Falmouth Station, please contact Lynne Broderick.